Name was registered in August of 2008, A.S. XLIII. Blazon: Argent ermined purpure, on a plumed great helm vert a cross of swords tips to center argent. Arms was registered in August of 2008, A.S. XLIII. Name was registered in May of 1992, A.S. XXVII. Blazon: Per bend paly argent and azure and azure, in dexter base a unicorn's head couped argent. Arms was registered in June of 1990, A.S. XXV. Blazon: (Fieldless) A harp azure. Badge was registered in June of 1991, A.S. XXVI. Name was registered in September of 2006, A.S. XLI. Blazon: Or, on a pale sable three cherry blossoms Or. Arms was registered in December of 2013, A.S. XLVIII. Name was registered in May of 1993, A.S. XXVIII. Blazon: Argent, a pall azure between a rose proper and two compass stars, a bordure azure. Device was registered in May of 1993, A.S. XXVIII. Name was registered in July of 1991, A.S. XXVI. Blazon: Gules, on a fess argent between four recorders, three and one, Or, a kris reversed sable. Arms was registered in July of 1991, A.S. XXVI. Name was registered in September of 2010, A.S. XLV. Also known as: Lenna Knarrarbringa, Lennabhair of Vatavia. Blazon: Per pale purpure and vert, two camels rampant addorsed argent. Arms was registered in September of 2010, A.S. XLV. Name was registered in June of 2016, A.S. LI. Blazon: Or, a cross azure, overall a raven displayed maintaining a bow and a quill pen gules. Arms was registered in June of 2016, A.S. LI. Name was registered in July of 1991, A.S. XXXIII. Blazon: Argent, a saltire cotised and on a chief azure three cinquefoils argent seeded gules. Arms was registered in July of 1991, A.S. XXXIII. Name was registered in May of 1990, A.S. XXV. Blazon: Per bend sinister sable and argent, two scarpes enhanced and a falcon contourny counterchanged. Device was registered in May of 1991, A.S. XXVI. Name was registered in May of 1994, A.S. XXIX. Blazon: Per bend sinister embattled sable and argent, a decrescent and a raven contourny counterchanged. Arms was registered in December of 1994, A.S. XXIX. Name was registered in April of 2002, A.S. XXXVI. Name was registered in December of 1999, A.S. XXXIV. Blazon: Sable, in pale a sun in its splendor and a lion dormant, a bordure wavy Or. Arms was registered in September of 2000, A.S. XXXV. Name was registered in May of 2006, A.S. XLI. Blazon: Sable, three hexagons, one and two, argent each charged with a Japanese wisteria sprig inverted sable. Device was registered in May 0f 2006, A.S. XLI. Name was registered in August of 2009, A.S. XLIV. 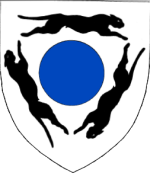 Blazon: Argent, a hurt between three domestic cats courant in annulo sable. Device was registered in August of 2009, A.S. XLIV. Name was registered in December of 1987, A.S. XXII. Blazon: Argent, a chevron, embattled and rompu, gules between two falcons striking respectant and a hammer bendwise, all within a bordure sable. Arms was registered in December of 1987, A.S. XXII. Blazon: Argent, a falcon striking sable within a bordure gules. For Household Grimfalcon. Badge was registered in December of 1987, A.S. XXII. Also known as: Samuel, Tilden. Name was registered in June of 2013, A.S. XLVIII. Blazon: Gules, in saltire a goutte between four lotus flowers in profile bases to center Or. Arms was registered in June of 2013, A.S. XLVIII. Name was registered in June of 2005, A.S. XL. Blazon: Per saltire gules and sable, a wolf's head erased contourny argent between in fess two keys wards to sinister chief Or. Device was registered in March of 2004, A.S. XXXVIII. Blazon: Vert, on a roundel between three equal-armed Celtic crosses argent a wolf sejant ululant sable. Arms was registered in September of 2006, A.S. XLI. Blazon: Per saltire argent and gules, in pale a dragon couchant contourny sable and a beacon sable flammant proper, a bordure counterermine. Badge was registered in February of 2007, A.S. XLI.